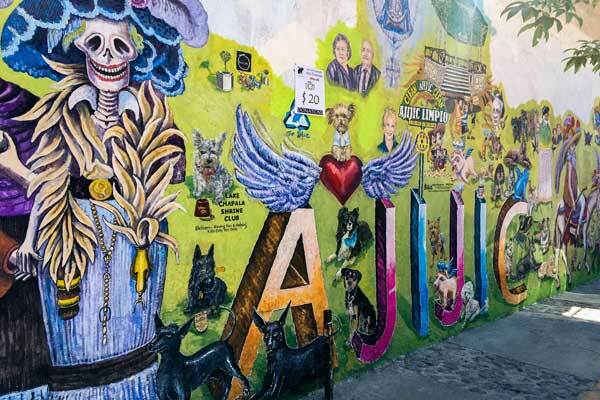 Ajijic was once a small fishing village, but has since been discovered by expats and artists. As full-time travellers, housesitting and writing about our global adventures for our travel blog, my husband Duncan and I travel to some incredibly interesting places. Mexico is one of our all-time favourites. It’s a country that we keep returning to. Since 2013, we have visited three times, spending over nine months in total travelling its length and breadth—and we still haven’t covered it all. Lake Chapala kept on coming up on our radar as a place to visit in Mexico, but for one reason or another, we just never managed to fit it into our full-time travelling schedule. We were housesitting in Boquete, Panama and planning our month-long adventure in Cuba when an opportunity arose for us to housesit for three weeks in Ajijic (pronounced “ah-ee-heec”)—one of the villages on the lake. This ticked two boxes for us; a visit to the area that we had always wanted to travel to and a cost-effective way for us to travel into Cuba. Ajijic lies just 40 minutes from of one of Mexico’s largest cities, Guadalajara, on Lake Chapala and shares the lake with two other smaller villages, Chapala and San Juan Cosala. Ajijic was a small fishing village until its beauty was discovered in the early 50s by expats and artists. The village is framed by the Sierra Madre Occidental Mountain Range, which protects it from the winds from the north. Chapala Lake is the largest natural lake in Mexico, measuring over 77 kilometres in length and 16 kilometres wide. Ajijic is said to have the second-best climate in the world, according to National Geographic. The average year-round temperature is 19 C.
Ajijic has a different feel to Chapala and San Juan Cosala. There is a feeling of sophistication as you wander through the cobblestoned streets. Dotted among the colourful buildings are small art galleries, artisan craft shops and small clothing boutiques. The restaurant scene here is alive and buzzing, offering not only local Mexican cuisine but also Thai, international, Italian, Creole and Mediterranean. Wander into the main plaza any time and you can enjoy great coffee, a cold beer or margarita and great food from the restaurants and bars that are constantly busy with locals, expats and tourists. A tip for you if you love tacos: on Sunday lunchtimes, besides the restaurant Coffee Black and White in the main plaza, a taco stand is set up where you can enjoy the best tacos we have tasted on our travels. But don’t tell everyone. Otherwise, we won’t get a seat when we travel back there next time. In Ajijic, the cobblestoned streets are filled with art. On the weekends, a few streets that head down to the waterfront are closed off for pedestrians and bars and restaurants spill out onto the cobblestones for all to enjoy. The Malecon (a popular park) is busy daily, from sunrise to sunset. You will see many locals and expats exercising. On the weekends, it’s a gathering place for local families enjoying their weekends off. Even local cowboys enjoy exercising their horses in the waters of the lake alongside the Malecon. The Wednesday Market is a gathering place for all. Good quality, local fresh fruit and vegetables, fish and meat stalls sit side by side with household goods, small cafes and the usual DVD and clothing stalls. Another tip is to get there early for the best of the produce. 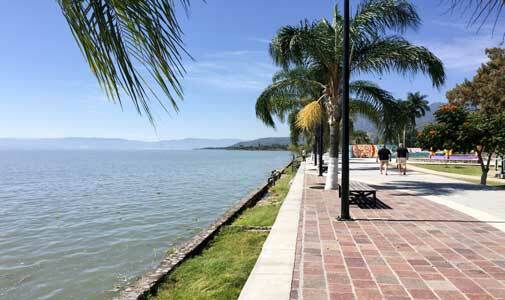 For expats, the Lake Chapala Society is a great resource. 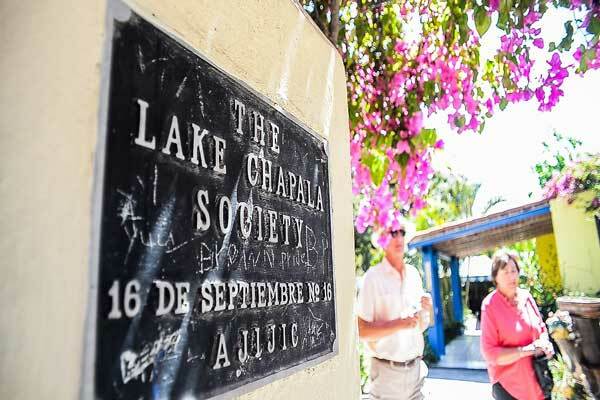 Lake Chapala Society provides a haven for expats, with a long list of activities on offer. Formed in 1955, it is now a garden haven for over 3,700 members and offers library facilities, Spanish lessons, arts and crafts lessons and exhibitions, dancing and cultural lessons, and a lovely garden café that serves great coffee and food. Mexico’s Ajijic is definitely a gem of a town.